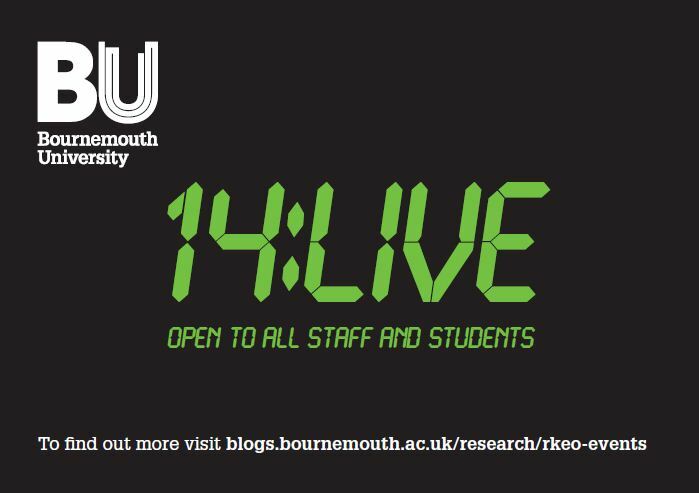 14:Live is a lunchtime research talk for students and staff that runs once a month in the Poole House refectory. The first 14:Live was run on the 22nd January and welcomed Professor Janet Dickinson from the Faculty of Management, below, Professor Janet Dickinson reports back on her experience of 14:Live. I wasn’t sure what to expect when I was invited by Sam Squelch to 14:Live in the Refectory, especially as it was an exam week. As it turned out, lots of students attended and we filled the space next to Papa John’s Pizza. My talk focused on an emerging idea based around the Internet of Things. This is where a growing number of objects can sense information about their location and current state, develop intelligence based on this information and share this with other objects and people through networks. I talked about my previous research with colleagues at Southampton, Edinburgh, Lancaster and Salford Universities where we had developed and explored the potential of collaborative travel apps to reduce car dependence. Through this we identified a challenge of reciprocal behaviour, where people are reluctant to ask for help due to a sense of indebtedness. This is where we see potential for the Internet of Things to help. The Internet of things has enhanced capacity to sense and interpret the world providing opportunities to anticipate the needs of people. There is scope to fluidly intercept people or resources, such as cars or items needed, to achieve day-to-day tasks and enhance community based sharing. This presents opportunities for parties who are currently less able to reciprocate and offers a route to modify the way sharing practices. We discussed how older people are particularly reluctant to ask for help and have been identified as a major area for Internet of Things interventions. Students raised a number of thought-provoking questions including how applicable the technology would be in less developed countries. Thank you all for coming along. The first 14:Live was a huge success with over 50 students in the audience, if this talk sounds like it is of interest to you, 14:Live happens once monthly so why not come along and claim your free token for an individual Papa John’s Pizza, as 30 are handed out for the first 30 audience members. For more Information about the first 14:Live and Professor Janet Dickinson’s talk, click here.